Bonsucro Week is Bonsucro’s flagship event, and has been held all over the world, from London, to New Orleans, Brazil, the Philippines and Nicaragua, to name just a few of the past Bonsucro Week venues. 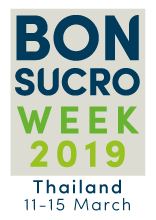 We’re delighted to announce that Bonsucro Week 2019 will be held in Thailand from March 11-15. Sugarcane is one of Thailand’s most important agricultural crops and critical to its economy. The sugarcane supply chain – consisting of the growers, millers and support workers – provides jobs for more than 1.5 million people and generates almost USD $6 billion per year. The country is the second biggest exporter of sugar in the world, and with three Bonsucro certified mills and many more working towards certification, Thailand is an ideal location for Bonsucro Week 2019 – so make sure you save the date!